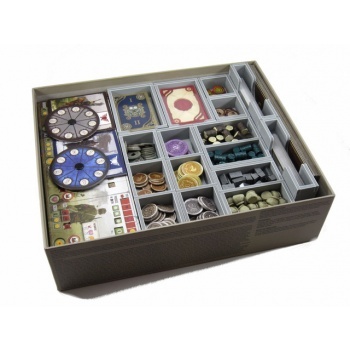 This Campaign 2 insert is designed to be compatible with Scythe®, and the Invaders from Afar® expansion.The design provides both efficient storage and improved game play. Many of the trays can be utilised during the game, and they greatly aid set-up and clear-away times. The rules act as a lid on top of the trays. 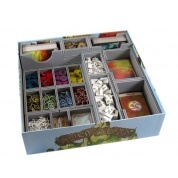 There are seven player trays, with separate slots for the miniatures and the player tokens. 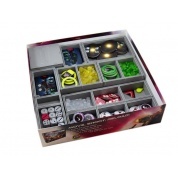 The eighth tray is for the combat cards and bonus tiles in one slot and the other tokens in the other slot. The combat cards can all be sleeved. The coin slots are split to have separate slots for each size of coin. 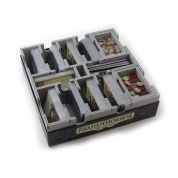 The two resource trays separate each of the four resource types. The remaining top layer trays are for the medium sized cards, the encounter and multiplier tokens. There is space for all cards to be sleeved. The two tarot sized card trays have space to separate the encounter and factory cards. Again there is room for all the cards to be sleeved with quality sleeves. The two tarot sized card trays height is designed to reach the top of the box. 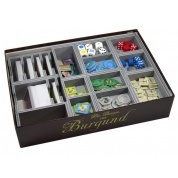 This leaves a carefully measured space for the board and the rulebooks. All the trays can all be used in game to help organise components during the game, as well as speeding up setup and clear away times. This product consists of a flat-pack of 8 Evacore sheets. The trays require assembly, which is quick and fun, using ordinary PVA glue. Detailed instructions are included in the package.